Dill (Fr. aneth) is a very popular northern herb. In Estonia it is traditionally used with fish, especially oily fish like salmon or trout, crab and almost inseparably with new potatoes. In the more southern countries dill becomes a rarity. In Switzerland one can still find it in the supermarket every day, but in the restaurants it is very rarely used. One of my favourite or perhaps the favourite restaurant in Bern Mille Sens is the only place that has managed to surprise me in the most positive sense with its use of dill. 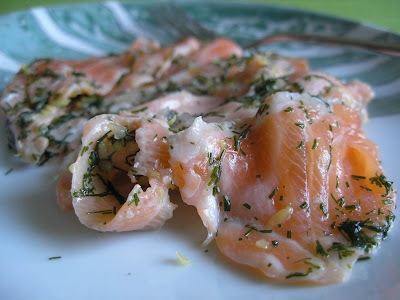 In this blog you can find some instructions how to make your own gravlax in one big piece - see under "Fish". I am a great fan of gravlax and generally of raw fish. For more variety I made it in a different way and was very pleased with the result. Instead of curing the fish in one piece I cut the raw fish into slices and then added the marinade. After some curing time the salmon with all its good omega 3 and 6 fatty acids is ready to be served with bread or with boiled new potatoes and some butter. It is an indulgent weekend brunch dish to be enjoyed withour any rush. It does not take a lot time and is cheaper than buying the cured fish. It is very simple to make and the taste can be varied by adding different ingredients. Next time, why not with either lime, orange, capers, horseradish, onion and/or mustard? Cut the raw salmon into slices as thick as you prefer. Wash the lemon. Peel off or grate off the yellow skin and chop very thinly. In a bowl mix the juice of half the lemon, sugar, salt and the chopped or grated lemon zest. 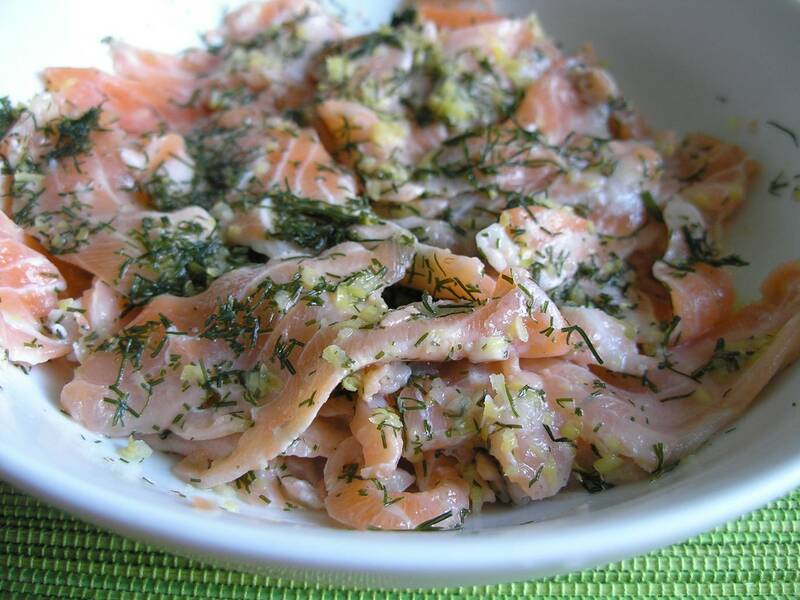 Put one layer of salmon slices into a bigger bowl or plate, sprinkle with some marinade and chopped dill. Repeat in layers until finished. Put the last dill on the top layer. Cover with aluminium foil and leave to marinate for 12 hours.